There really are no words to express how much I miss Joyce. Her picture continues to pop up all over the blogosphere with her wonderful smile. Each time I see it I stop and think how blessed I was to call her my friend. Last weekend I had the pleasure of escaping into the pages of Murder Fir Christmas . I am so thrilled that her voice will live on and touch us forever with stories like this. 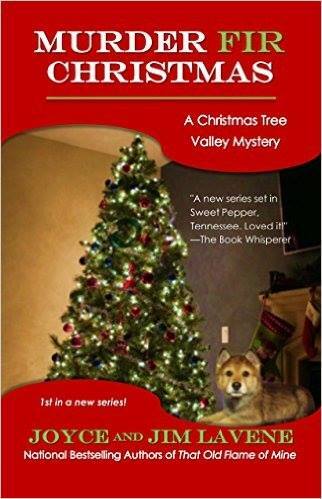 I am a huge fan of the Sweet Pepper Fire Brigade Mysteries by J.J. Cook , aka Joyce and Jim Lavene , so when I heard they were spinning off another series set nearby in Christmas Tree Valley I was over the moon! We first met Bonnie Tuttle in the Biscuit Bowl Mystery Series. Now the Federal Wildlife Agent comes home to the valley after being away in Alabama for years. Her mother is starting to show signs of Alzheimers and her brother has taken a new job in Germany. Bonnie is taking Harvey Shelton’s place as wildlife agent and will also be running the family’s Christmas tree farm. Maybe everyone has forgotten why she left or she will be too busy to care if they do remember. She is thrust right into her new job when there is a fire and several animals need to be rescued. She heads to the scene with Harvey. Shorty after they arrive gunshots ring out and Harvey is hit and killed. A wolf pup is also shot and Bonnie finds herself with a new friend as she takes care of him. Who would want to kill Harvey? Bonnie tries to see the forest through the trees to catch the killer before she or anyone else is fired upon. All our favorite characters from Sweet Pepper welcome Bonnie to the area. Fire Chief, Stella Griffin, the ghost of former Fire Chief Eric Gamlyn and Police Chief Don Rogers throw out the welcome mat and then chaos erupts as the fire call comes in and the mayhem continues. These characters are already near and dear to my heart. They are wonderfully written and spring right from the pages. Winter in Christmas Tree Valley is dangerous because the road can snow shut or be covered with ice or both. The road was closed before Bonnie could even get home the first day. The Lavene’s paint pictures of the scenery so clear with their words. The blustery wind, the frigid cold, I was almost shivering myself. They also brought the valley to life. I could envision the tree farms, Harvey’s cabin office, and all the beautiful sites as we traveled down the hill from Sweet Pepper. The mystery itself played out in a way I never suspected. Such good twists and turns. I can’t say more because I am afraid I will say too much. An awesome cozy story! Mystery with just a flake of folklore and a touch of paranormal and a little romance too. These authors have imaginations that are truly off the charts. They have blended these series together is a wondrous way yet given them the footings to stand on their own. I really like Bonnie and I truly hope Jim and the family keep this series going. I want to visit this area as often as possible. Note – You do not need to read any of the other books to enjoy this story. It stands alone perfectly. Murder Fir Christmas sounds like a great holiday book! I am looking forward to reading it. A wonderful book! 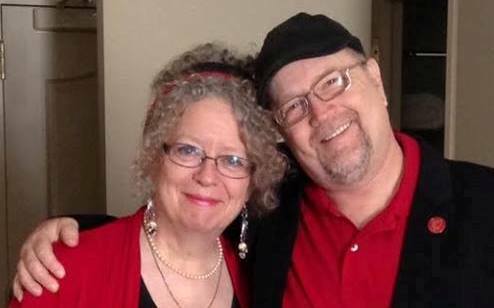 I, too, am glad Joyce’s voice will live on in the stories she wrote, with Jim. Definitely on my TBR. Bittersweet that Jim finished it, and you’re right, Joyce will live on through all these wonderful books. I have loved each boon I’ve read that Joyce and Jim Lavene have written. I love reading holiday mysteries this time of year. Thanks for a chance to win your latest. A fun read and I think she would knows that her memory lives on through her work. What a lovely review! A great tribute to Joyce and Jim and family, I know, will appreciate this! I will be reading it as soon as I get a copy. I’ve read this book. It is particularly good. This looks great! I’d love to win! Thanks for the chance! I always enjoy holiday-themed books and have been known to read them at any time of year.